New executive saloon on sale now. Badged E 300 e, the newcomer joins its diesel-electric sibling, the E 300 de, in Mercedes’ range of plug-in executive saloon cars. From the outside, this eco-friendly E-Class looks much like any other, but under the bonnet lies a 2-litre turbocharged petrol engine with a “hybrid module”. On its own, the petrol engine produces 208 bhp, but the electric motor adds a further 120 bhp to the mix. 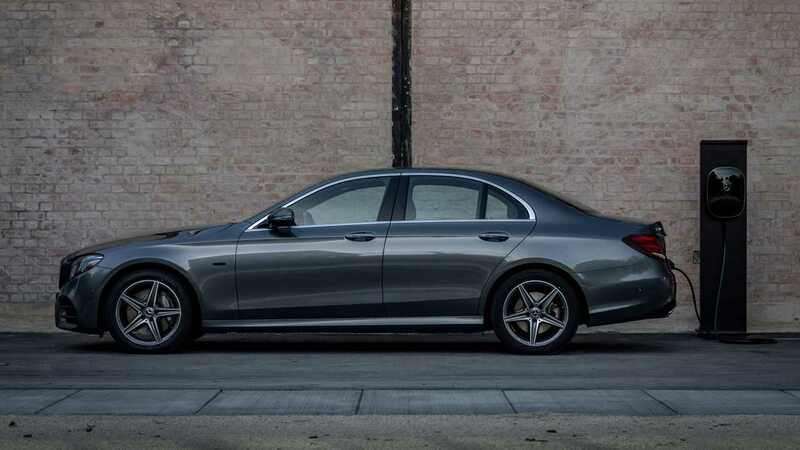 As a result, the E 300 e can sprint from a standstill to 62 mph in 5.7 seconds before topping out at 155 mph. But despite the performance statistics, the car is also capable of travelling for 31 miles on a single charge, allowing it to return 134.5 mpg on the official economy test and CO2 emissions of 46 g/km. That means it’s exempt from the London Congestion Charge. Charging the 13.5 kWh battery from 10 percent full to 100 percent will take less than two hours using a 7.4 kW charger, or less than four hours using a standard three-pin domestic plug. As with the conventional petrol- and diesel-powered E-Classes, the E 300 e is being offered in a choice of trim levels. The entry-level SE model costs £47,450 and comes with a widescreen digital instrument and multimedia display, front and rear parking sensors and 18-inch alloy wheels. Electrically adjustable heated front seats are included in the price tag, too, as is a parking assistance feature and black open-pored ash wood trim. If you’ve got £49,945 to spend, however, you can have the AMG Line version, which adds sportier body styling, full leather upholstery and an AMG steering wheel. Privacy glass is thrown in too. But if you want to add more kit, you’ll have to turn to one of the numerous packages available. The Premium package offers memory functions for the electric seats, wireless device charging and a 360-degree parking camera, all for the princely sum of £2,395. If you spend £4,395, though, you get all that, plus a Burmeister surround-sound system, keyless entry and an automatic boot lid, plus a panoramic glass sunroof. Cheaper packages are available, however. The Night package, which adds black alloys, a black louvre in the radiator grille and black trim on the bumpers will set you back £595, although the Comfort package, which adds air suspension, is considerably more expensive. Available only in conjunction with the Premium or Premium Plus package, it costs £1,895 on SE-spec cars and a massive £3,295 for AMG Line cars, although that does include more sumptuous leather seats. The first E 300 e models are expected to arrive in the UK in the spring of 2019. 15 Comments on "Mercedes-Benz Puts A UK Price Tag On New E300e PHEV"
Before people start piling in here and scream about how pathetic a 31-mile battery range is, let me say: It doesn’t bloody matter. Who here thinks that people who own this car, especially in the US, will plug it in after the first two or three months? I sure don’t. Isn’t 31 miles (50 km) the new legal minimum for PHEVs in Europe? The legal minimum is zero, clearly. It is about getting less than 50gramm co2 per kilometer. Than the cars count double for the calculation of the fleet co2. Since the WLTP is more strict than the NEDC the phevs have to have a 10 – 15 % larger range than they did before September 1. 2018 to get that sweet sweet double counting. In Spain for get the “0” sticker, 40 km of electric range are required. Maybe other countries could have other requirements, but it seems still there isn’t a common criteria about this. If you’re going to say outrageous things, you need to provide proof. Exactly….as long as there is an ICE engine in there, and no verification that they are in EV mode in the cities, most will just use it as a hybrid. However, if their daily commute is well below 31 miles, there is a better change the owner will plug in. There should be a requirement that PHEVs must have an outside indicator that shows they are in EV mode vs hybrid mode for cities that require EVs. If it saves people money and lets them avoid going to the filling station as much, then they’re going to plug it in… especially if the parking spot they use at home has a plug right there. Sure some people throw money around unwisely but often people who have worked hard enough to be able to afford this car are sensible about even little savings. Additionally these PHEV’s are often more quiet and elegant when the ICE is off which makes it worth the effort to plug it in. Lastly many folks believe what the 97% of climate scientists say regarding climate change and don’t want to be part of the problem so they will not only plug in at home but might go out of their way a bit to park in a charging spot when out and about to get even more EV miles. you clearly have never driven let alone owned a PHEV and have no idea what you’re talking about. As a PHEV owner, I can tell you the joy of being able to spend 80% of my driving in EV is amazing. The car is quiet, torque is instant, and the drive is silky smooth. Even when the combustion engine comes on in a PHEV, typically at lower speeds you still get that silky drive. And unlike a pure EV, you never have to worry about range anxiety or road trips. For me personally, a PHEV has little to do with the little savings you get from charging or eco emissions, although I am thankful for that too. And btw charging each night is not a big deal whatsoever if you live in the suburbs. Not all people with $ think like Trump and are willing to kill their grandchildren’s future. Many care. For that money, well, one can get a Tesla. Not in the UK, and you would have had to been on a waitinglist for 30 month or so..
You could also get an OK boat for that money..
Tesla will sell very well when it arrives. Will be cool to see how many and how quick they can deliver cars. They have a long waiting list to build cars for, and if they get the price low enough – they can sell a lot. With the current price, it cost the same as almost 3 Peugeot ion EVs. Not that they are competitors either. Just like the PHEV from MB is a competitior to the Tesla Model 3.. The problem with these premium vehicles is that they are mostly used as company cars for employees. There for the driver will not plug them in as they don’t pay for fuel themselves.